1. Preheat the oven to 180°C, gas mark 4. Peel the artichokes and cut them into 0.5cm-thick slices. Bring a large pan of water to the boil. Add the lemon juice and parboil the artichoke slices for 6-8 minutes, then drain. 2. Meanwhile, melt the butter and oil in a large frying pan over a medium-high heat. Add the chicory and cook, stirring, for 4-5 minutes until lightly golden. Season and set aside. 3. Heat both the creams in a large saucepan, then stir in the mustard, artichokes and potatoes. Cook gently for 5 minutes; season. 4. 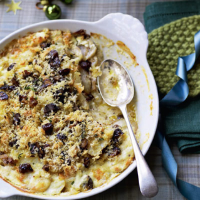 Grease a 22cm x 16cm or 1 litre gratin dish and spoon in half the creamy vegetables, spreading them out evenly. Arrange half the chicory on top, then repeat with the remaining vegetables and chicory. 5. Roughly chop the chestnuts and mix with the thyme, breadcrumbs and cheese. Scatter over the dish and bake for 1 hour, until the vegetables are tender. Check the topping every so often; if it is turning too brown, cover with foil.